This year some of the hottest toys are, once again, LEGO. Toyblogging is instituting a rule of no reviews of toys we haven't played with, but having played with the previous version of these sets, I'm quite certain they are going to be amazing. I'm talking about the latest Minecraft sets from LEGO. 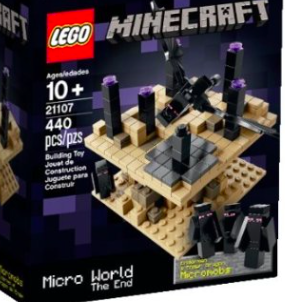 I'm focusing right now on the micro worlds, and of the set, my favorite is The End. For those of you who haven't played the game, this is the "final level" of sorts. Of course Minecraft isn't really a game, but let's just say there's this thing you can do which transports you here, and you get to kill a dragon. It's pretty epic, and this set really captures the creepy vibe of that "world." I'm hoping to take a look at the bigger Minecraft sets, which The Verge did a good rundown of here. Once again LEGO will no doubt top the toy charts, seeing as Minecraft is such a huge business that none other than Microsoft bought them this year!